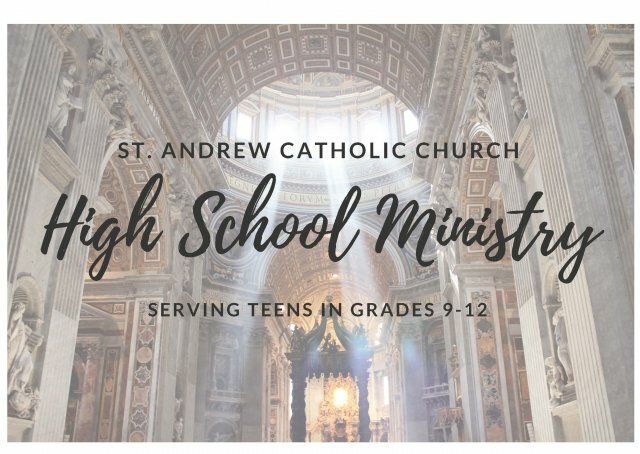 Welcome to St. Andrew Catholic Church High School Program! Our program is for high school students in grades 9-12 and spans two nights: Wednesdays and Sundays. Wednesdays are Faith Formation nights in which youth attend classes designed to instruct them on basic Catholic teaching and develop their understanding of our faith. Sundays are Youth Nights structured to educate our youth and foster a vibrant teen community within our church. Our desire is to create an environment so rich with God's love that it empowers teens to be witnesses to their faith in all aspects of their lives.